Flew elegantly points out that Stenger’s argument is invalid and so atheists still have no answer to this question of why something exists rather than nothing. Yet they arrogantly (and ignorantly) believe that they do. I highlight the powerful testimony of DNA, it’s information bearing properties and the information it contains in the articles Windtalkers and DNA and The Poor Marksmanship of Evolutionists. Given such evidence, it is clear that atheists and evolutionists have no answer to the question of the origin of life – but they try – with looking glass results. You can see some of the fallacious answers (and my responses) that are offered in the comments after Poor Marksmanship, and in item 6 of GULO and Other Irrational Arguments by Atheists, Part 2. These all demonstrate the same thing: while atheists and evolutionists believe they offer valid answers, in actuality they are answers worthy of Wonderland because they are clearly invalid – though those offering them appear unable to see that. Granted, these answers are not from credentialed or well known atheists or skeptics – but as Stenger’s response illustrates – such answers are no better in terms of actually answering the question at hand without falling to some logical fallacy. The author of the above quote claims to have debunked many accounts in the the Bible, including the resurrection account. The historicity of the resurrection has been established numerous times by numerous historians and apologists. I give you a couple below.8 No doubt Loftus and atheists like him are unpersuaded by such evidence – but that is to be expected from those who live in the backwards world of the looking glass. The Bible describes their approach to life well: they are willfully ignorant of the truth. (2 Pe 3.5) Jesus advises not to follow such self-deceived people because they are blind guides (Matt 15.14) – who will eventuality fall into a pit – taking you with them if you follow. 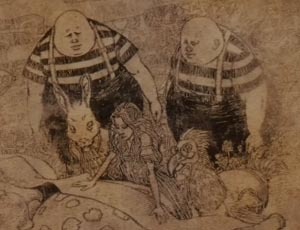 When Alice came across the poem JABBERWOCKY – she could neither read it nor understand it – until she realized that having gone through the looking glass, what she was looking at was a mirror image. When she put it up to the looking glass the words were at least in the right form, so she could read them – but she still didn’t understand them. To her credit she was honest enough to admit she didn’t understand it. Unlike pretentious atheists – who put arguments in the right form, but still don’t recognize their arguments are invalid for other reasons and don’t make sense, and so they have proved nothing. Rather than correct themselves when this is pointed out they remain willfully ignorant. For false Christs and false prophets will appear and perform great signs and miracles to deceive even the elect–if that were possible. God’s chosen can identifying false miracles from false prophets without error; identifying their false stories will be just as easy. If you want to know the truth, go to the one who is himself the Truth – Jesus Christ. (John 14.6). This is a “formal fallacy”; it is not a correctly formed contrary statement; in fact there is no deductive reasoning anywhere – the first statement is meant to be accepted as a premise; but the second statement negates the premise, then contradicts itself. The second error is the non-formal fallacy of circular reasoning. Tweededee and Tweedledum have already decided the outcome – their argument winds up with the very premise they started with (what you’re thinking is not true) – the clear mark of a circular argument. This entry was posted in Apologetics, Atheism, Bible, DNA, Irrational Thought, Logic, Philosophy, Resurrection, Science and tagged Anthony Flew, Lewis Carroll, Martin Rees, Stephen Meyer, Victor J. Stengel, William Lane Craig by Duane Caldwell. Bookmark the permalink.